Learn what questions you should ask when buying a standby generator for your home. I’ve learned about generators, and I’m interested. What are some key decisions I’ll have to make before selecting a unit? Whole-home emergency standby generators are located outside your home, ideally near both electric and natural gas connections that serve your home. If your home has a natural gas connection, but it is located on the opposite side of the house (as compared to your electric connection), the generator will most likely be located nearest your electric connection and natural gas piping will be run along the foundation of your home from the natural gas connection to the generator. If your home has no natural gas connection, alternative fuel sources may be available (see “Fuel Source” below), and their locations will be factored into consideration as well. Other factors, such as existing landscaping, required safety clearances, and more may come into play as well. Modern generators are relatively quiet when operating. Of course, however, noise levels are relative and dependent upon operating efficiency, nearby structures, landscaping, and more. Most modern generators include sound insulation material that significantly mitigates the noise when the system is operating. For additional sound mitigation, you might consider planting shrubbery or doing other sound-dampening landscaping near the generator. Generators come in various sizes and are generally rated by kWh. For example, two common sizes include 14 and 20 kWh units. Basically, however, the question you need to answer is, “What do I want or need to keep running when the power goes out?” If it’s just a few lights and your refrigerator, a smaller generator may serve you well. If you’re looking to keep your whole home running (i.e. all the lights, all your appliances, heating and air conditioning equipment, hot water heater, garage doors, electronics, and more), then you’ll need a larger unit. Just keep in mind that, the larger (and more complex) your unit, the costlier your project will be. However, this investment may very well be worth it for your family’s safety and security. Your Tuckey Mechanical sales team can help evaluate your needs, work with your budget, and recommend a unit that’s sized appropriately for you. 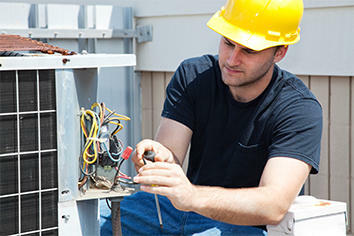 When thinking about installing a generator, some homeowners picture a huge, unsightly box outside their homes. However, today’s generators sport sleek designs, and most fit within a 2 ‘ by 4 ‘ footprint (plus some clearance around each side for safety). All told, a standby generator can actually fit nicely into a landscaped yard – or even simply on a small slab beside your home or garage. Never thought “generator” and “curb appeal” would go together, would you? But that can indeed be the case! Generally, three fuel source options are available: natural gas, propane, and diesel. If natural gas service is available at your property, it’s usually the lowest cost and most convenient way to go. If not, most homeowners would be looking at a propane-fueled unit. Some standby generators are diesel-powered; however, these are generally larger units that are designed for very large homes or office and industrial buildings. Tuckey Mechanical Services sells, installs, and services most major brand names, including GenerAC and Eaton. Some makes and models come with features that others don’t offer (such as Smartphone-compatible controls and alerts). We’ll work with you on your requirements and budget to recommend the model that makes the most sense for you. Many different things factor into installation projects, which means that some may be quick and easy, while others are longer and more complex. For an ideal job, consider a 2-day average installation time. Again, however, this may vary drastically depending on project specifics, including weather conditions, project complexity, unit size, and more. If you have any questions regarding installation expectations, be sure to speak with your Tuckey salesman or project manager – we’re happy to answer any questions you might have. https://www.tuckey.com. To request further information, contact us at (717) 524-1136 or info@tuckey.com.